Time to show you the other two cards I made for the Women’s Retreat. Both these card patterns are taken from our new Make It From Your Heart publication. Here is the first one, where I added Chocolate to the Avonlea paper. I love how this one turned out! I used the Artiste Cricut Cartridge to cut the speech bubble. It looked a little too plain for my liking so I stamped a pattern on top in 3rd generation (stamp off 2 times before stamping on your image). To add a bit of bling, or maybe a lot of bling, I added the Shimmer Trim in 2 layers to the Chocolate strip. I also added thick sponging to the pattern paper. Here is the last card. I really wanted a colour that would pop since this would be a birthday card. I think Sorbet does it. Thanks to Tresa Black for her colour confidence chart. I sponged all the pieces in Slate before putting this card together. I love the elegance of this banner stamp. A few Bitty Sparkles finishes it off. I made all three of these cards fairly flat because I’m guessing that there may be some new stampers in my workshop. I also wanted to make sure the cards would be fairly easy to mail. Do you live near me? Consider coming to the Retreat put on by my parents’ church. Click here to take a look at the brochure. 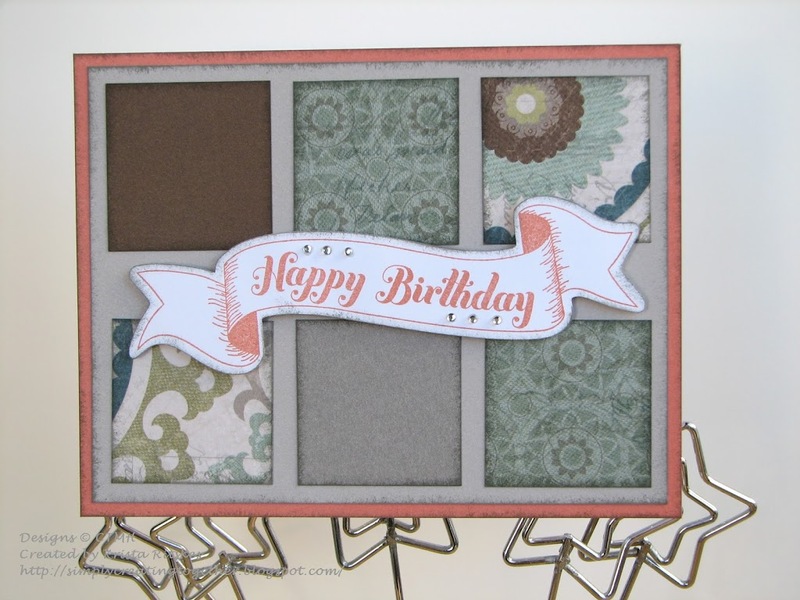 Such pretty cards and surprising color combos with Avonlea. I love the Chocolate with it. Cute use of the speech bubble. I always think I need to use it with a character but this is perfect!